How does a guy have SEVEN Turnovers and only 9 points, but still dominate the highlight reel? 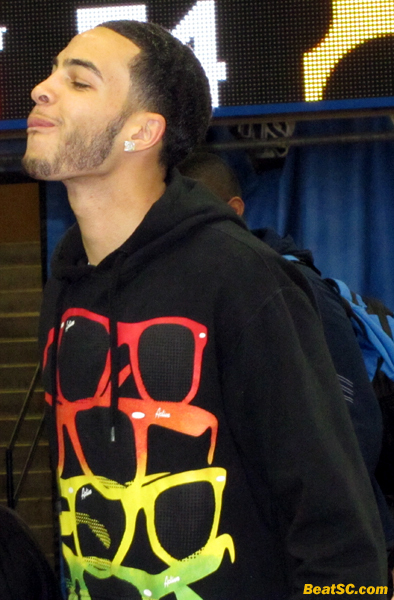 Just ask Tyler Honeycutt. The Bruin Forward led UCLA to a sloppy but convincing 69-61 victory over Oregon State on Saturday afternoon, with 5 nifty Assists and 8 spectacular Blocked Shots. Honeycutt aslo grabbed 5 Boards and 1 Steal, to steady the Bruins during a mistake-filled, 26-Turnover, roller-coaster game. Thanks to the 1pm tip-off time, the Bruins didn’t start slowly, like they do when they have to wake up early. In fact, the Bruins had one of their best starts of the season, racing out to a 24-6 lead. The Bruin Defense was in top form, as the frigid Beavers couldn’t BUY a basket for the first twelve minutes of the game. But when the Bruins found themselves up by 18 Points, against a team they had beaten twelve times in a row, they got complacent and unmotivated. They started turning the ball over again and again, allowing Oregon State all the way back into the game with an 18-5 run. The score was 29-24 at the Break. OSU cut the lead to 4 just after Halftime, but that was as close as they would ever get. From that point, UCLA exploded again, behind a flurry of blocked shots and insde hoops, building the lead all the way up to 22, with 7 minutes left in the game. But guess what happened then? The Bruins got comfortable again, and allowed the Beavers to make a game of it. The Beavers shaved the lead all the way down to 12 with about 3 minutes to play. UCLA had to buckle down and play smart to finally put the game away, by breaking the Full Court Press, and by making their Free Throws. And in a bizarre twist, Coach Ben Howland emptied his bench with a minute to go, but after two straight Turnovers, had to put the starters back in to keep a disaster from happening. Even with the starters in, the Beavs still trimmed the margin to 8 before the horn sounded. With Honeycutt and Reeves Nelson scoring only 9 Points each, the Bruins needed Malcolm Lee to supply the Offense, and Lee obliged. Malcolm tallied 19 Points, giving him a whopping 44 for the week. For the second game in a row, Lee was able to regularly penetrate the opponent’s zone, to get close to the hoop for inside scores. Also exploiting the Beavers’ defenses was Joshua Smith, who scored 15, and collected 6 Caroms. He also blocked 3 shots and snagged 2 Steals. And other contributors off the bench were Tyler Lamb, who hit a Three-pointer (after hesitating), and Brendan Lane, who scored 5 Points (despite an Airball Free Throw) and got 6 Rebounds, in just 10 minutes. It was Lane’s best performance in weeks, as his confidence level was visibly higher than in his last several games. Jerime Anderson also made some nice plays while backing up Lazeric Jones, who is still playing through pain. The victory was the Bruins’ 5th straight, and 9th out of 10, and it put them a half-game behind Arizona in the race for the Pac-10 Title. Meanwhile, sc lost at Home to Oregon, so in the Standings, there are only two teams worse than the trojans. Obviously, they will have to win the Pac-10 Tourney if they want a berth in March Madness, and at the rate they’ve been dropping, the NIT might not want them either. Hopefully, their dismal season collapse will discourage Nikola Vucevic from returning for his Senior season, which would mean yet another season with no Postseason play for the trojans next year… just like Football, pending their Appeal. 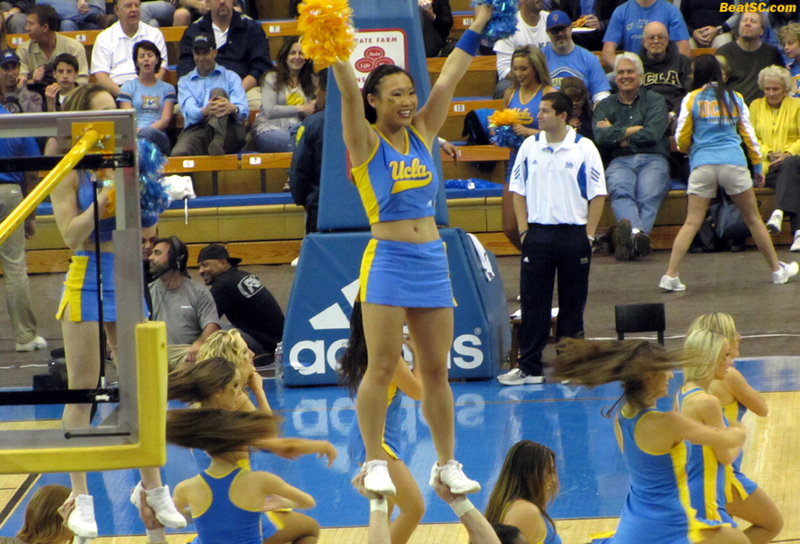 And speaking of APPEAL, here are 30 more photos from Thursday night’s game, 29 of which feature the massively-appealing UCLA Spirit Squad (including some more pics of the Cheer Squad, in their newish outfits, as promised). "THE BLOCK MAMBA" was published on February 13th, 2011 and is listed in Blue & Gold News, UCLA/usc/Cheerleader Photos, UCLA/usc/Sports Photos. 26 Pathetic turnovers: That’ll get ’em swept up north. The Bruins need to learn to maintain their FOCUS, and CLOSE TEAMS OUT. UCLA was up by 22 points with less than 6 minutes to play, and stopped attacking OSU’s press and started running clock, resulting in UCLA losing offensive AND defensive intensity. THERE WAS NO GOOD REASON TO STOP ATTACKING! For a team that is inconsistent on offense, and treats the basketball like it’s on fire, I knew what was going to happen, but apparently Howland didn’t. Terrible decision. San Leandro High School standout Jared Cunningham, tied for second in the country in steals, must have thought he hit the lottery. The team’s only blowout all year was in its first game. A blowout conference game would have been good for the team’s confidence, and given the poor Lippert’s a rare chance to play a few minutes, so that they would have some practice crossing half-court with the basketball. Attacking the press and the basket, along with keeping some fraction of their defensive intensity they had to build a 22 point lead, would have accomplished this. Instead, we end up with an 8 point game and an embarrassing ending. Howland – LET THEM FINISH TEAMS!!! They certainly need the practice! Since I am still irritated by Saturday’s game, I will continue my post. I believe appropriate times to “run clock” are with a moderate lead (I would say 6 to 12 points) AND with less than 3 minutes to go in the game. Further, in cases where the team with the lead is at home and unquestionably the better team (sound familiar? ), these parameters may be even a little bit tighter. I realize many may think my parameters are too restrictive. I believe that running clock is unnecessary with a lead larger than 12, and unwise with a lead smaller than 6 or with more than 3 minutes remaining, since there is such a risk of losing momentum (and the lead!) when doing so. Instead, when comfortably ahead, teams should take only high percentage shots, but LOOK FOR A GOOD SHOT DURING THE ENTIRE POSSESSION, NOT JUST THE LAST 10 SECONDS. How often do college teams get good shots after holding the ball for 25 seconds?? Even for those who disagree with my parameters, you must agree that UCLA was NOWHERE CLOSE to those parameters (or anyone else’s except Howland?) when they started to slow up on Saturday.